The Badger Tech is the Hoofer Sailing Club's unique sailing dinghy. It is the secret to the club’s success. It is perfect for instruction: its rigging is easy to learn for beginning sailors, it is easy to un-capsize, and its heavy-duty hull is designed to withstand… a little bump here and there. 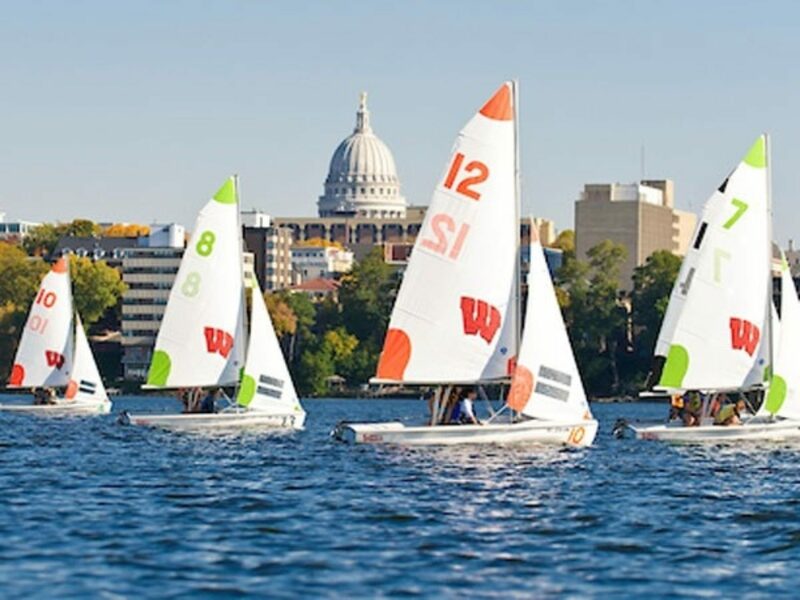 The Hoofer Sailing Club has a total of 30 Badger Techs, with an average of 20 ready to sail on any given day. Tech Racing happens most Friday evenings starting at around 5:30. The first Tech dinghies were wooden craft designed by the at the Massachusetts Institute of Technology (MIT), and their descendants still ply the waters of Charles River in Boston at the MIT Sailing Pavilion. The Hoofer Sailing Club sailed Techs from its early days until 1967. That year, club commodore Peter Harken adapted the MIT design to create the Badger Tech. He expanded the bow air tank, then rounded off the gunnels and deepened the transom to create even more flotation. His design makes for a heavy boat, but one that's served the club for 5 decades and counting. The Badger Sloop is an 18 foot sloop rigged boat unique to the Hoofer Sailing Club. Fast and stable, the Badger Sloop is the ideal boat for afternoons on the lake with friends and racing alike. An excellent boat for both beginners and experienced sailors, the Badger Sloop is a great introduction to sailing larger boats and never fails to deliver a fun experience, no matter one's level of experience. It is based on the Interlake design, but with a flatter bow and more room fore to aft for seating. 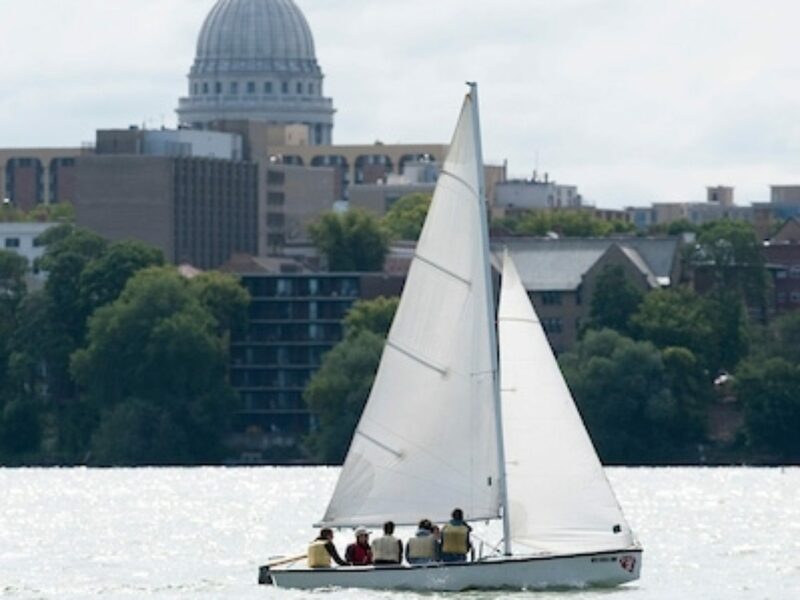 Our fleet of eight boats was built by Windward Boatworks of Middleton, WI. With a large, open cockpit, the Badger Sloop accommodates up to six including the skipper, allowing you to share the sailing experience with up to 5 of your friends. 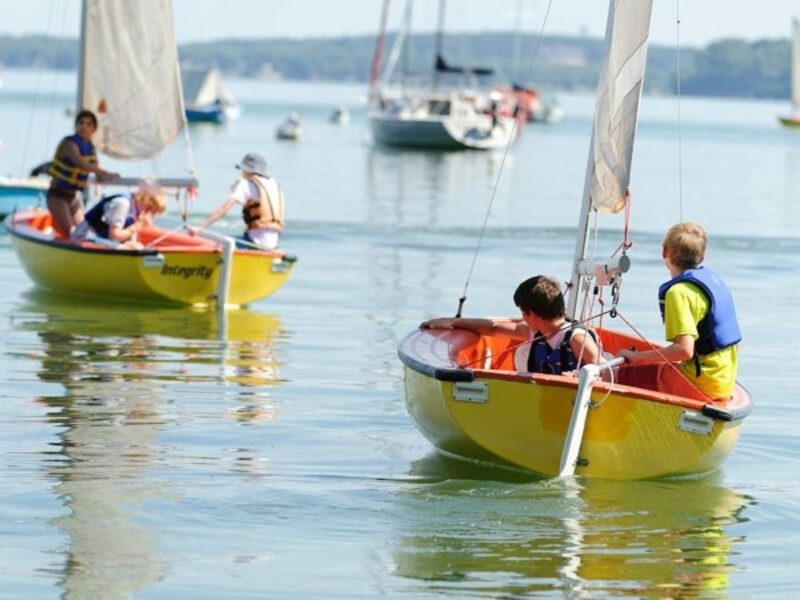 The 420 is a superb boat for junior sailing programs, with over 3,000 boats sailed in youth programs all over the United States and Canada. 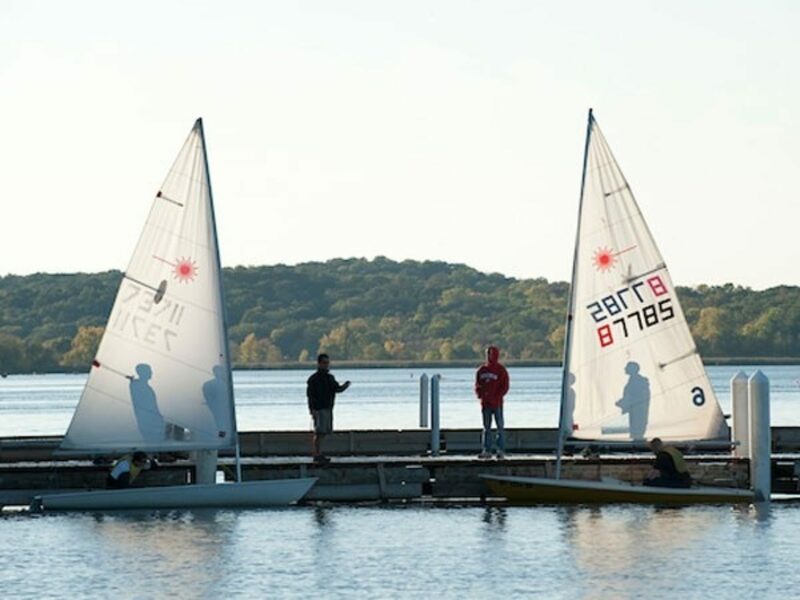 These are also the boats used by our collegiate sailing team to compete at a local and national level. At 420 cm in length they are the smaller version of the Olympic class boat the 470. They move well, even in lighter air, and on a good day will plane out and scream across the lake. These boats are a ton of fun in a race or just a day sail. Definitely make a point of getting your 420 rating, or finding someone with theirs who you can go out with. The Laser is a 14’ one-design racing dinghy has a huge sail area to weight ratio, making the boat very agile and quick. This design provides a more challenging (but don’t worry almost anyone can learn to sail one!) and fun sailing experience than most small dinghies! Designed in the late 60’s and introduced in 1971, the boat’s speed and aggressive behavior quickly made it popular with dinghy sailors all over the world. The Byte is a small and fast sailing dinghy sailed by one person. It is basically a Laser for smaller people. 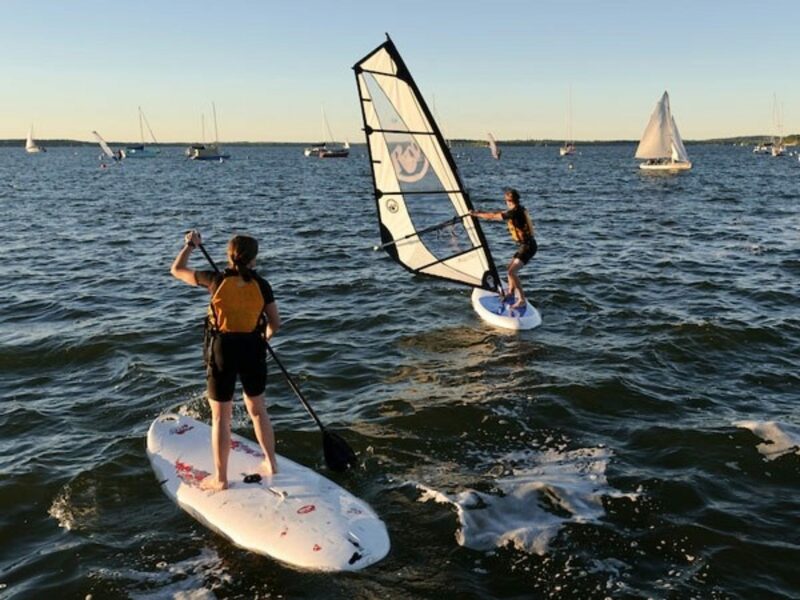 The Byte is designed for sailors weighing 120 to 145 pounds although most sailors weighing 90 to 160 pounds should have no problems sailing this boat. Our Byte fleet was funded by a large donation by John Kirsch, who loved to sailed them since he was too thin to sail Lasers properly in heavy winds. He thought we should have a fleet for youth and lighter men and women that was as fun and educational as the Lasers. Here at Hoofers, the Scow Fleet consists of a number of E-scows, C-scows and MC-Scows. Built as a performance boat, the scows are particularly fun for those interested in racing and becoming a competitive sailor. However, due to their size, many people enjoy sailing the scows at Hoofers for fun, the most popular being either the C-scow or the E-scow. Scows can be sailed with a variety of people on board, the most common number being two and going up to five. Come and check out the Scow Fleet for all your racing interests if you're down at the Lakefront! The J/22 class attests to being: "One of best sailing boat they've ever been on, including other J's. It's responsive, safe and stable thanks to its fixed lead keel, while still as much fun to sail with main only as it is to plane under spinnaker in 18+ knots of wind." Since its introduction in 1983, the J/22 has blossomed into an International class now with 1550+ boats sailing in 65 fleets in 18 countries. On the merits of its sailing characteristics, widespread popularity and small crew number (3-4), J/22's continue to be an integral part of the Hoofer's fleet. Whether your style is weeknight beer-can racing or competing on the world stage; the J/24 is undeniably the most popular racing keelboat to make waves around the world. This appealing keelboat started with one man's desire for a sailboat to accommodate his family and to be a competitive racer. Twenty-seven years later, the J/24 has become a legend. A stable sailboat for family togetherness, the J/24 has also been the competitive launch pad for the careers of numerous America's Cup professionals. While some of the world's best sailors have the latest version J/24, a well-prepared 1977 model, built to the same shape and weight with rigid end-grained balsa core construction can still win the J/24 Class world championship even after 30,000+ miles of trailering. That's "One Design" racing! The International J/24 is presently built in the U.S., Argentina and Italy and has more than 50,000 people sailing 5,200 boats in 27 countries. The Capri 22 was introduced in 1983 as a high-performance family racer/cruiser that could be trailer-sailed or kept dockside. Designed by Gary Mull (of America's Cup lineage) and Frank Butler, it was intended to be Catalina Yacht's answer to the highly successful J-24. More than 1,000 Capri 22s have been built in the last 20 years. The CP22 has proven to be a stable, safe boat, yet one that is fast and fun to sail. Originally built in 1975, the O'Day 25 measures at just shy of 25 feet and is one of two light swing keel craft currently in our fleet. People who have sailed this boat remark about her spacious interior and ease sail of handling. by pulling up her swing keel, you can get close to shore than most would expect and gain speed some when heading downwind. Cinger is one of the vessels in our fleet with a furling jib, making it easy to get just the right amount of jib no matter the wind, not to mention making derigging a breeze. "Simplicity, trailerability, durability and the endearing and enduring qualities of the Catalina 22 helped to launch the trailer sailing market. She's one of our two swing keel craft, a feature that allows trailer launching and recovering like a powerboat, yet very nearly achieves the sailing performance of a boat with a fixed keel. The Chargeback boasts a spacious cockpit, easy handling characteristics, and lightning fast rigging and de rigging thanks to the roller furling jib. She's Perfect for a day out on the water with friends and family, or as a trainer for the clubs larger cruising oriented Heavy Keelboats. Siege, Sassafras and Rhubarb are Tartan 10s, 33ft fractional rig sloops designed for racing. They are the largest boats in the hoofer fleet and have all raced on the Great Lakes! Siege was first sailed at Hoofers in the summer of 2017 while Sassafras and Rhubarb started their Hoofer careers in the 2018 season. Like the popular J24, the T-10s are a one-design class meaning that they are limited to the same sails, crew size and other modifications to keep racing competitive based on skill. 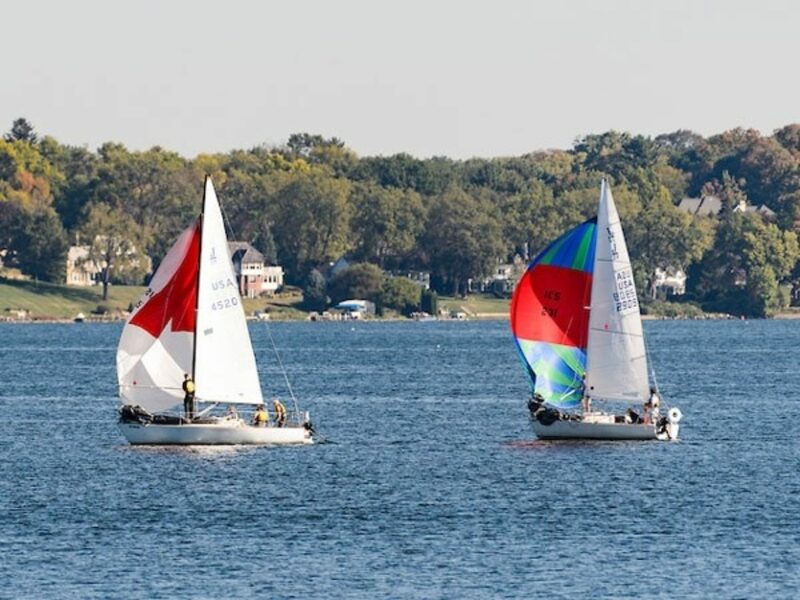 Experienced and beginner sailors can crew the T-10s in the Mendota Yacht Club races, learning skills such as sailing under spinnaker, fine tuning sail trim, reading the wind and geometry of a course and timing a start. See https://en.wikipedia.org/wiki/Tartan_Ten. 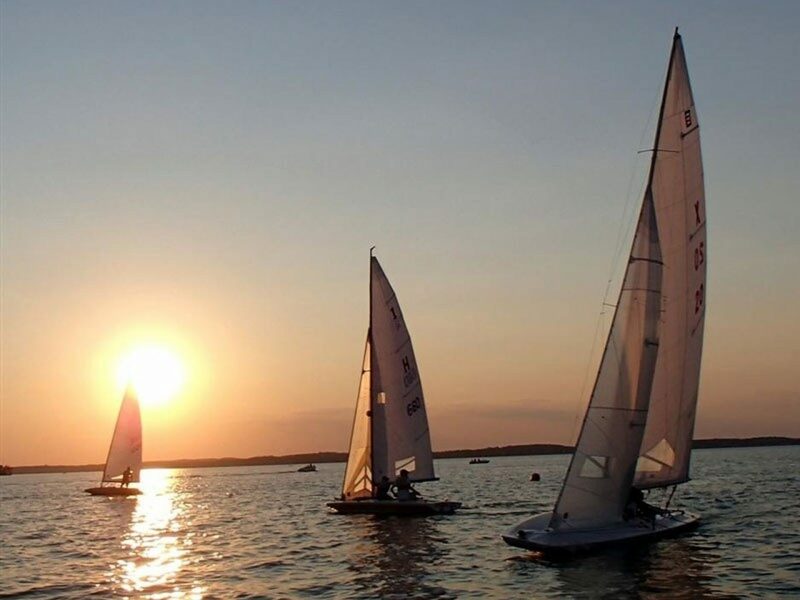 And https://www.tten.com/ for more information and tips on sailing these popular boats. Spray is a Sovrel 30 – a 30 ft classic cruising yacht made in 1973. Norbert and Ruth Schmitz, former Hoofer members, sailed over 20 summers on the Great Lakes with their family on Spray before donating to Hoofers in 2003. In 2006 Spray was refurbished with the hard work of dedicated Hoofer members – giving experience in boat repair and maintenance as well as refreshing Spray for generations of Hoofer sailors. Spray is built for stability with 3500 lbs of lead ballast off her keel and a centerboard that increases the draft from 4 ft to 8 ft 4 in. Lessons on Spray focus on cruising and basic sailing skills including care and use of the inboard diesel engine. Salam is an Ericson 26 and her name comes from the Arabic word meaning "Peace." She is part of the club's cruising keelboat fleet, (which also includes Spray and Knotty Rascal), and is appointed with many creature comfort features traditionally found on cruising sail boats. With nearly a 5 ft draft and a spacious cabin the Ericson 26 is designed to be comfortable for daysailing. Knotty Rascal is a Precision 27 and is part of the Cruising Keelboat fleet. With a length of 27 ft and a beam of 10 ft Knotty is roomy and comfortable with many of the amenities you expect on a cruising vessel. Currently she is the only Hoofer boat with wheel steering – a common feature charter boats have if you intend to sail outside of Hoofers or on larger bodies of water. She has a 3 ft 7 in draft with a wing keel to aid with stability and upwind efficiency. The Yu Chen Windsurfing Fleet is made up of a large variety of sails and boards. Sails range in size from 3.0 to 7.5 (measured in square meters); our most popular sizes run anywhere from a 4.0 to a 6.5. Boards range in volume and size from wide, stable boards that make learning a breeze, to small "sinker" boards that allow you to get out in the windiest conditions. What do sailors do during the winter? In our never-ending quest to have fun on Lake Mendota, the Hoofer Sailing Club has a full fleet of Snowkiting equipment. 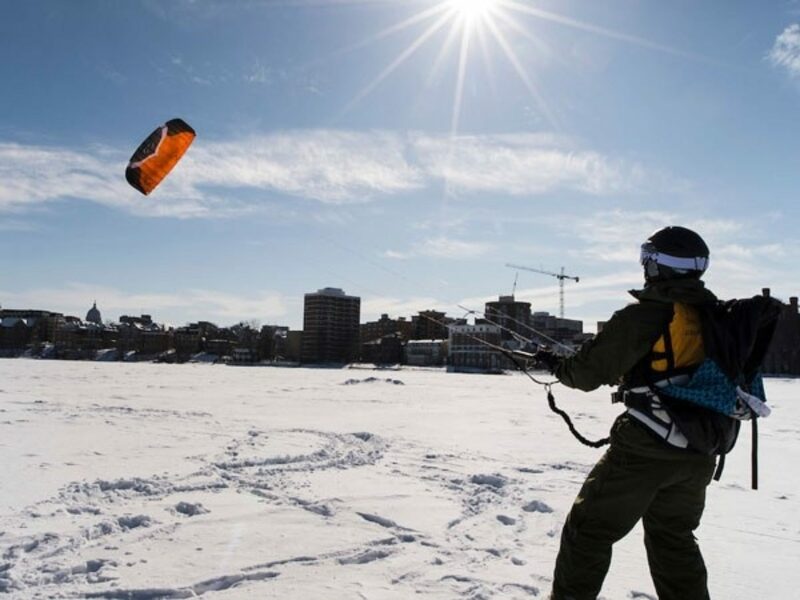 We offer snowkiting-focused lessons year-round. Our local lakes are an ideal spot to start in the world of kiting — thick snow-covered ice and strong winter winds make learning easy. 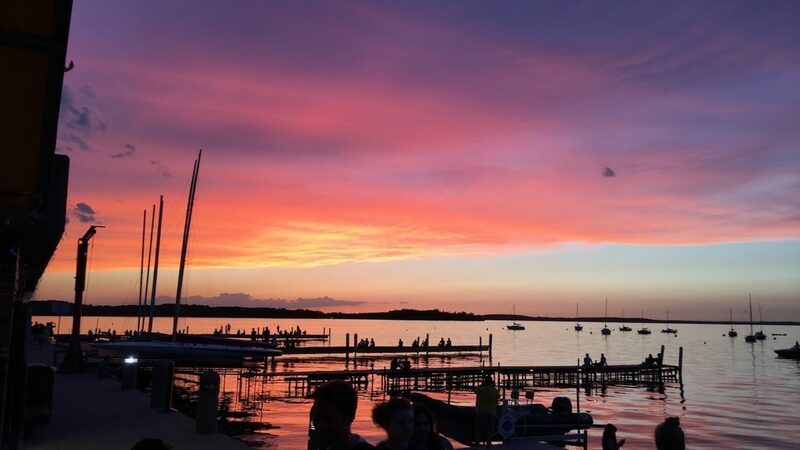 Our curriculum begins with a focus on developing strong kite skills and safe practices in lessons at local parks, then for advanced lessons we move onto frozen lake Mendota in the winter months to teach riding on skis or snowboard. During the winter riding season we also host snowkite racing and other fun competitions for riders of all ability levels!